Stocks continue to live in la la land. While the media and investment herd celebrate a V-shaped stock recovery based on the Fed admitting things are far worse than previously known, more and more signals are appearing that the global economy has run off a cliff. Germany and France are bordering on recession. Italy is definitively already in recession. Japan is on the verge of another contraction. And China is facing a systemic collapse (real GDP growth is 2%, not the ridiculous 6% they claim). Meanwhile, in the US, profit margins have peaked, and corporations are facing massive headwinds as the credit cycle turns. General Motors and Nvidia are the two latest economic bellwethers to lower guidance for 2019. They join Caterpillar, Amazon, Apple, Samsung, LG, Fed Ex, Johnson & Johnson, Nautilus, Tesla, Tailored Brands, Signet Jewelers, Delta, Skyworks, Macy’s, Kohl’s, and American Airlines. Put simply, every single sector in the economy has lowered forward guidance. This means they believe that 2019 will be far worse that was previously expected… just like the Fed. Meanwhile investors are piling into stocks as if we’re going to new highs. The whole mess is very reminiscent of 2000 and 2007: both were periods in which investors completely ignored the fact the economy had come off the rails and piled into extremely an overbought/ overvalued stock market. We all remember how that ended. 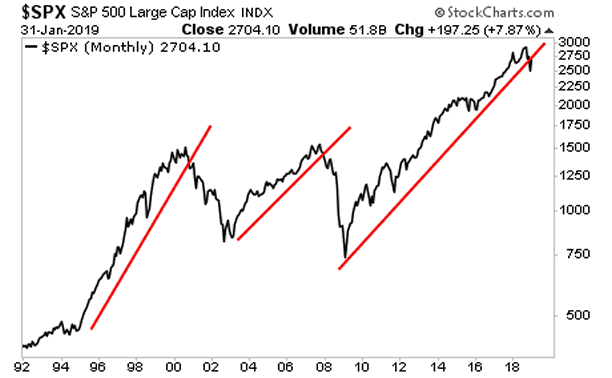 By the way, the stock market has just broken its monthly trendline just as it did during those years as well.